Right now, I’m watching grass grow. Like literally. Up where I live, when you get a cycle of hot days and wet weather, the grass goes bananas. It’s like literally leaping out of the ground. I swear if you watch closely (in the late afternoon, from the deck, with a G&T in hand) you can see it growing. Which is great if you like a healthy lawn, but also a bugger because the mow cycle drops to about weekly this time of year. If you let it go two weeks, it starts to look scrappy, and if you let it go three or four weeks… well, then it becomes a real shambles. So as I’m sitting here (on the deck, G&T in hand, writing a blog), I’m thinking, there’s a life lesson here. Grass, like many things in life, is something you need to stay on top of. Organisation has it’s own reward. If you stay on top of your to do list, you can hit things before they get to that unmanageable stage. Mow the grass regularly, and each session is relatively brief. Lets say 1 hour. But let it drag out, say twice as long, then you spend more than 2 hours, more than twice as long, trying to get it back under control. You’re losing time in the long run. That’s why I invest in my organisation. I’m always curious to know what project management tools are out there. Why? Because I simply value my time. So teaching of grass no.1: staying on top of things saves time in the long run. Number two is the way we approach grass that has gotten too long. The right thing to do obviously, if the grass is up around your knees, is to set the mower to a high gauge, go over it once, drop the gauge down, and do it again. The wrong way to do it is to set it to the gauge you ultimately want and just slog into it. 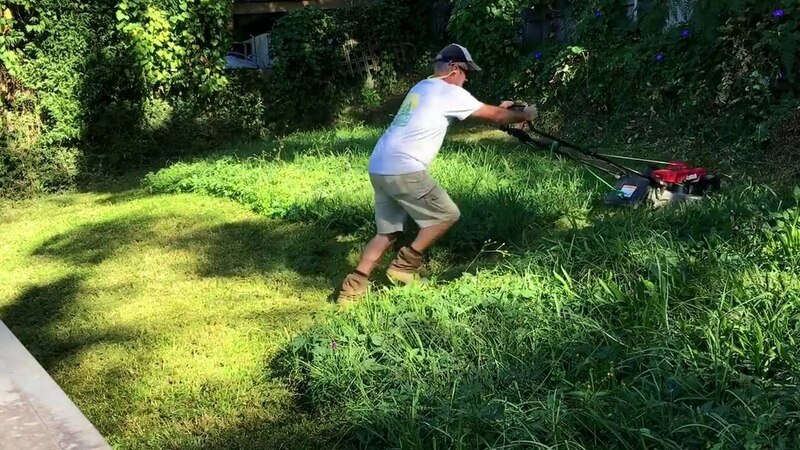 The mower clogs up, and it’s like pushing a wheelbarrow through snow. Now I tend to meet a lot of people who have let the grass of life get a little too high. Their debts are a bit out of control, their investment properties are bleeding cash, and they’ve got a handful of years left in them before they’d like to retire. But generally the grass too high people tend to want to take the wrong approach. They fixate on where they want their life to be, and set the mower gauge to that. So they want to replace their income. Totally reasonable. But that’s not the first blush. If you swing for the fences like that more often than not you’ll come up empty. The first blush is to just bring the grass back down a notch. Get on top of your debts. Stem the bleeding from your existing properties. Manufacture equity and improve your serviceability. From there, then we can think about replacing income. From there we can think about strategies for making that thing look like a lawn bowls green. Step 1: Get it under control. Step 2: Pretty it up. You’ve got to pick the right strategy for the right stage of life. Now, how else can I squeeze more juice out of this lawn-mower metaphor? Oh! You’ve got to keep your mower blades sharp! Of course. Sharpen the saw, as they say. Keep your skills current and razor sharp. Revisit old training sessions, book yourself in for a conference, sign up to the next level of training. Put it in your mind for something you can’t wait to do in 2018. It’s something every successful investor I know does. 2018 is shaping up to be a huge year for us. Really hope I see you life mowers round the traps again somewhere soon.